A few month’s ago we revealed Facebook’s ambitious plan to take on premium video content providers like Netflix. Officially, the new video content wasn’t supposed to launch until the 28th of August, but keen-eyed Facebook users in the US are already starting to see it. In the last few days, Facebook has begun rolling out a new ‘Watch’ tab in its mobile, desktop and TV apps. ‘Watch’ enables you to discover personalized recommendations of live and recorded video content for you to check out. The first round of video content consists of reality TV, live events, and scripted programs that have been handpicked by Facebook. Currently, only a select number of creators can upload video content, but Facebook says they “want any publisher/creator who is interested to be able to create a show in the future”. With over 2 billion active users on Facebook, this is an incredible opportunity for you and your business. Now is the time to start creating your content, so that you’ll be in a prime position to get a head start on your competitors when Facebook opens ‘Watch’ to all content creators. In breaking video marketing news this week, YouTube announced it is rolling out a new in-app direct messaging service, which is very similar to Facebook Messenger or direct messages on Instagram. Now when you hit the ‘share’ button on a video, you’ll see an option to share the video directly in the YouTube app with your contacts. You can add contacts by importing them from your phone book or send an individual invite link to those you want to add. You can also engage in one-on-one chat, or invite a few people to form a group chat. Once you're in a direct message, you can add emoji reactions to shared videos, and quickly add more of your recently watched videos to the direct message. YouTube understand that they need to keep people on their platform if they are to compete with their biggest rivals including Facebook. Up until now, you had to leave the YouTube app in order to share a video with your friends. YouTube is hoping that this new messaging service will keep users on the YouTube platform for longer, which will lead to even more videos being watched by YouTube users. As a business owner it’s important to understand how major changes like this work, and the best way to learn is to jump in and use the new direct messaging service. So open up the YouTube app on your phone right now and see if you have the new share option. If you do, help us help you by sharing this video with your friends via YouTube messages. 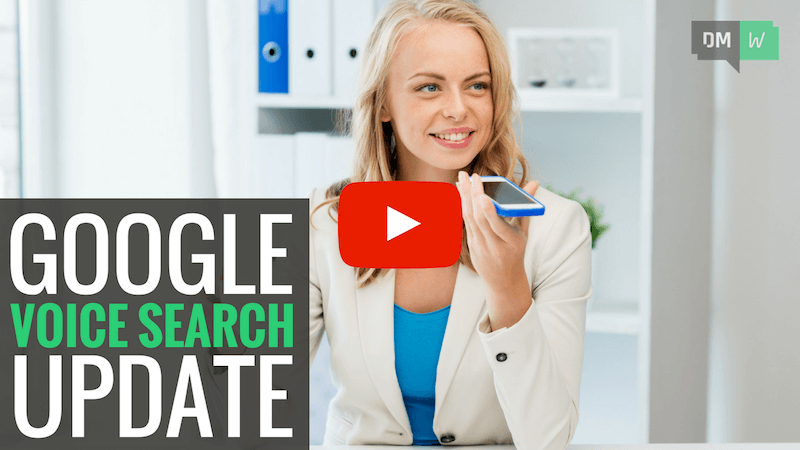 In SEO news this week, Google added 30 new languages and locales to Voice Search. Voice Search allows users to use Google Search by speaking on a mobile phone or computer. This latest update brings the total number of supported language varieties in Google’s speech recognition to 119, which covers more than a billion people! What this means from an SEO perspective is that it’s now important to optimise your content for common text AND voice searches. For example, a user looking for information on how to fix a leaking tap would probably type something like "fix leaking tap". However, the same query as a voice search may be "what’s the best way to repair a leaking tap". By optimizing for both text and voice search terms, you increase the chances of your content being found, which in turn should lead to more traffic to your site.